Dental Marketing Ideas for your local library – Part 2 – Hayden Consulting – Where Your Success in Business and Life Matters! If your local library is anything like mine, they get a lot of traffic. People of all ages visiting from within the community. So why not start planting some marketing/advertising seeds at the library? Collect new or gently used books to donate to your local library. Invite patients and non-patients to come by the office and donate books. Promote this event via your social media sites, the local newspapers, in-office fliers, on continuing care postcards and to your patients when they come in for their appts. Incentive: Gift Basket or Gift Card (put together a fun themed gift basket)- Every person that donates books can enter a drawing to win the gift basket or gift card. Take a picture of the donated books. Put together toothbrush gift bags w/office information and a special offer for library employees to deliver with the books. Send a press release to your local newspaper with pictures about your book drive and the results. Library Events Calendar – Check your library’s event/programs calendar to see how you can be involved or help promote upcoming events and programs. Visit the Library – Offer to come in for a dental health presentation/demonstration/science experiment. Similar to what you might do during Children’s Dental Month. Or offer to have the dentist come in during story-time to read a dental related book or two. Library Social Media Sites – Be sure to comment on, like and share posts from your library’s social media sites on behalf of your office social media pages. Bookmarks – Create fun, interesting Bookmarks for your local library that include your office contact information. Deliver these bookmarks as a gift to the library to give away during their programs and events. Toothbrush bags – Throughout the year the library hosts several events that bring in people of all ages. Why not make up some toothbrush bags for them to hand out at some of these events. Be sure to use imprinted toothbrushes. Lip Balm – Personalized lip balm is a great give away! It’s inexpensive too. Lip Balm Express is one of my favorite companies. Pencils – Imprinted pencils that the children can use to fill in their reading logs. Prizes – During special library events, they may offer little prizes to the children. Why not donate Little Prizes that they can give away to the children. If you get individually wrapped prizes be sure to place a label on them that says Compliments of your office name. If they are not individually wrapped, be sure to add some type of tag to the prize that includes your office contact information. Act now to get your name in front of all the people in your community that will be visiting your local library. If you have any dental marketing questions that I can help you answer, please comment below. If you are not yet receiving my free dental marketing ideas every month to your inbox, please follow today! Also, if you enjoyed this post feel free to give it a “like”. Thank you! This entry was posted in Customer Service Tips, Dental Success, Marketing Ideas and tagged betty hayden, betty hayden dental consultant, book drive, childrens dental health month, community book drive, customer service, dental advertising, dental consultant, dental cross marketing, dental education, dental marketing consultant, dental marketing ideas, dental marketing ideas for february, dental marketing ideas for may, dental marketing ideas for october, dental marketing to libraries, dental office book drive, exceed patient expectations, exceeding patients expectations, free dental marketing ideas, get caught reading month, grow your practice, have fun at work, hayden consulting, how to bring in new patients, how to get dental new patients, how to get more new patients, how to get more referrals, how to get new chiropractic new patients, how to grow your dental practice, library lovers month, marketing ideas, national book month, national childrens dental health month, new patient offer, winter dental marketing ideas. Bookmark the permalink. Thank you so much Gizelle!! Pingback: Dental Practice Management and Marketing Idea’s for March (2016) – Hayden Consulting – Where Your Success in Business and Life Matters! Pingback: Dental Practice Management and Marketing Ideas for April – Hayden Consulting – Where Your Success in Business and Life Matters! Pingback: Dental Marketing Ideas for October – Hayden Consulting – Where Your Success in Business and Life Matters! 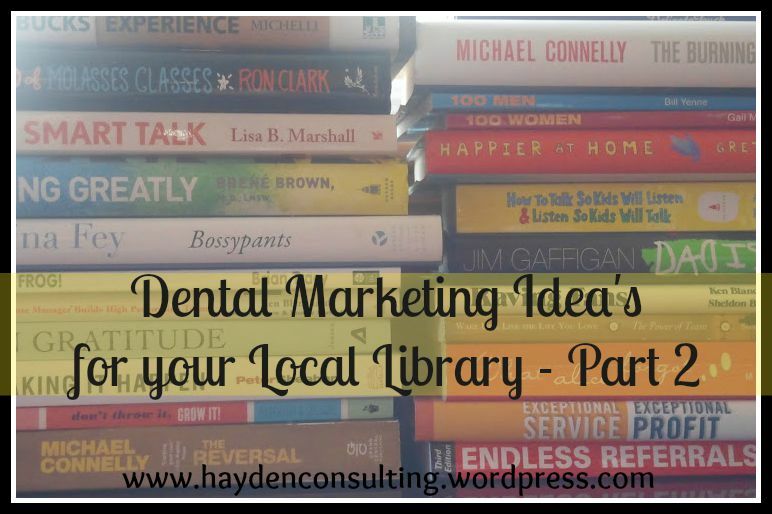 Pingback: Dental Marketing Ideas for your Local Library – Hayden Consulting – Where Your Success in Business and Life Matters!